The challenge was that the perfect location on the face of the building was all glass windows and the sign they wanted to have would feature illuminated channel letters. Our sales, design project management and engineering team worked in collaboration with the Forum’s electrician to create the solution to make it happen. The letters were mounted to a raceway that was painted to blend into the tinted windows. We then conducted a technical survey that showed a steel beam above the windows. The fabrication team produced straps that were anchored above the beam, allowing the sign raceway to hang at the perfect height for maximum impact. In January our professional signage installation crew completed the challenging installation – using our 62’ crane truck to place and secure the illuminated channel letters at the Haverhill Valley Forum skating rink. 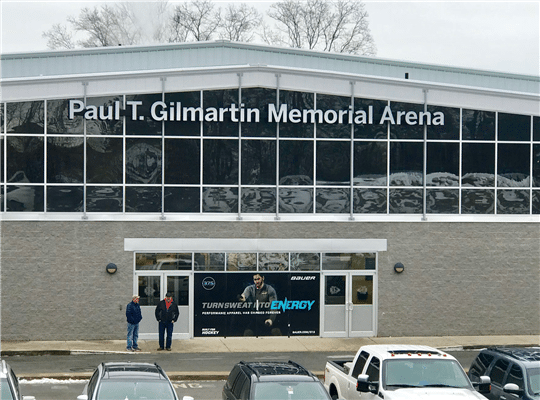 On February 2, the arena was dedicated in memory of Gilmartin, the founder of Valley Associates, who had a deep passion for the game of hockey. Gilmartin, a longtime resident of Andover, was a member of the 1960 State Championship hockey team, a lifelong fan and strong supporter of the sport. As the founder of Valley Associates and GLS Partners, Gilmartin gave many young players the support they needed to develop in their sport. It was our privilege to work on this collaborative project and to ensure that he is well remembered in the valley. We thank the Gilmartin family for the opportunity to work on this project. It is gratifying to know as people see the sign, when entering the building or driving by, they may be inspired to contribute their time and energy to the activities and organizations they care deeply about.